As your tour ends, two more objects catch your eye. High on the ceiling at the far end of the great room are two painted panels. One shows a turtle, the other a crane, each an ancient symbol of long life and happiness. In September, 2017, these two icons stood for a day on the topmost beam of the roof. On the ground below, a traditional ceremony marked the completion of the framework of the building. Streamers of black, white, red, yellow, and blue fluttered in the breeze, their colors recalling the ancient Chinese symbolism of water, metal, fire, earth, and wood. An altar held offerings of vegetables, fruits, dried foods, salt, sake, and rice, in thanks for the divine gift of land and the bounty of nature. In the spirit of that ceremony, we thank our visitors for coming to see the Takeyama Rice Retailer Shop. May kame the turtle and tsuru the crane be with us as we preserve the treasures of the past and create the wonders yet to come. The alcove, or tokonoma, is an essential feature of Japanese home design, and this room includes a beautiful example despite the narrow dimensions of the space. Here the family would hang a decorative scroll and place a seasonal flower arrangement, as you see today. Other art objects might also be displayed – a fine vase, perhaps, or a small sculpture. The tokonoma is like a tiny museum, adding its welcome to the family’s hospitality for customers and guests. 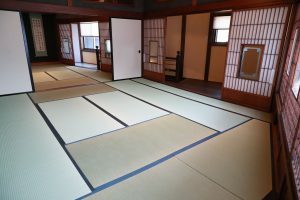 Did you notice a small windowlike opening in each side of the tokonoma near the floor? Architects call that an ostium, a Latin word for mouth. 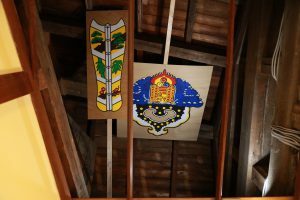 In Japanese it’s a horaguchi, or chinkuguri, bringing light to objects on the alcove floor. The sturdy posts framing the alcove are the main feature of the room. The post on the left is a very hard black persimmon wood called kurogaki. The other is kaede, or maple. Feel their silky surface and you will know that they are the finest wood in the building. Another construction feature is this room’s wall finish. 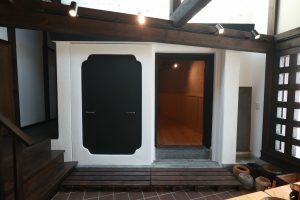 It’s made of fine-grain sand mixed with a binder and painted over a mud wall, a fireproofing technique once common in traditional Japanese architecture. 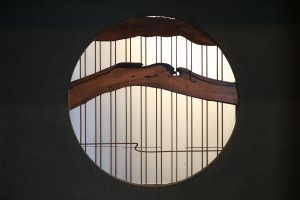 It not only helps to tame the heat and humidity of our seaside climate, but also works to soften the indoor light and diffuse it as it reflects off the tiny “mirrors” on the grains of sand. The sand finish around the round windows is actually the original material, scraped off the old wall and applied anew. 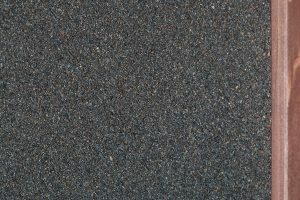 A similar sand finish called juraku is visible on nearby surfaces. The builders of long ago were not only artists but ingenious craftsmen as well. 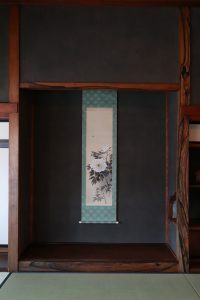 In the back wall, framed in wood, is a sample of takekomai-shitaji-tsuchinuri-kabe, a mouthful that translates as “bamboo small weave underlying soil painted wall.” A base is created by weaving bamboo and rope in a grid pattern, then plastering it with a coarse soil mixture, then applying a top coat, and finally painting the finished wall. During restoration, workers carefully removed the grid and the old soil mixture, then rebuilt the wall with new soil. What a great opportunity for school children to learn how their forefathers did things! In came the kids to help rebuild the wall, and to leave messages on little boards for a future generation to discover inside the wall. That depends on which way you turn when you get to the landing halfway up. We’ll make the choice for you: Turn left. Japan is a land of volcanoes, and this warehouse was born in one of them. Its stone is called Shiogama rock. Geologists know it as tuff, a volcanic rock fused together from bits and pieces in an eruption millions of years ago. Quarried in Naruse, a town in the city of Higashi-Matsushima in Miyagi Prefecture, it was laid in blocks like brickwork to form the building’s sides. 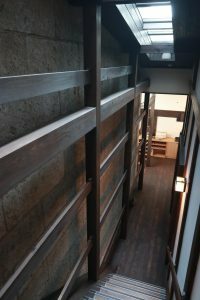 Walking through the new corridor between the main building and the warehouse, visitors can see this stonework and the “Wooden Method” of framing it, with horizontal beams joined to vertical pillars by a “tongue” pegged into a slot to form a joint called mortise and tenon. 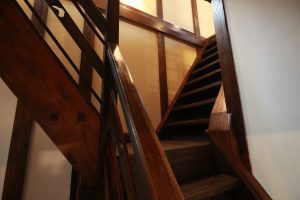 Also visible is the bamboo latticework that supported a layer of board or sheet, which would then be painted. Now that you have seen the rooms downstairs, you will want to see the rest of this historic rice shop. So walk back into the main building and over to the unusual split staircase. Here it’s obvious why the warehouse was not moved along with the main building and reconnected as before. It is made of stone, so it had to be left in place. But with the new annex, the main building is once again connected to the old warehouse. How old? We don’t know. We can see it in a photo taken just after the great fire in the Showa era, so we know it was built before 1929. One theory suggests that its contents survived that fire because the family had used a soybean paste as a gap filler in the construction of the door, thus keeping the fire from getting inside. Sadly, nothing could keep out the surging seawater in the 2011 tsunami. Along with household goods, it swept away most of the records of the business, going back to its beginnings. Now we cannot say whether the warehouse stood at the time of the 1914 fire. 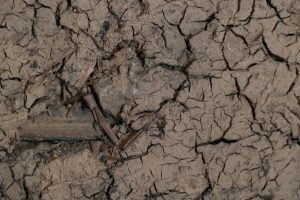 The best guess is that it was built sometime between the two great fires, perhaps on the trapezoid foundation of a structure that burned. Happily, not everything was lost by fire or flood. 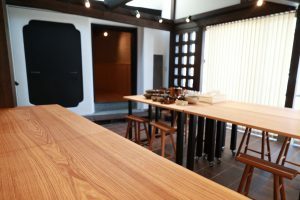 The old warehouse is now a mini-museum, displaying the family’s tableware from the Meiji and Taisho eras along with rice cookers, old and new, and on the second floor an archive about foods and rice. You have already seen how this building was moved to one side to make room for the road, and the empty space was filled with a new annex in 2017. As you walk through the annex past the kitchen, you are walking where the main building once stood. Then, in the back, you enter the old warehouse.